Deep below the bustling streets of Beijing, China, is a whole other world–one whose hidden existence is a badly kept secret. The city is home to 21.5 million people, but several thousand of them live in these underground tunnels that extend up to three stories below the ground. 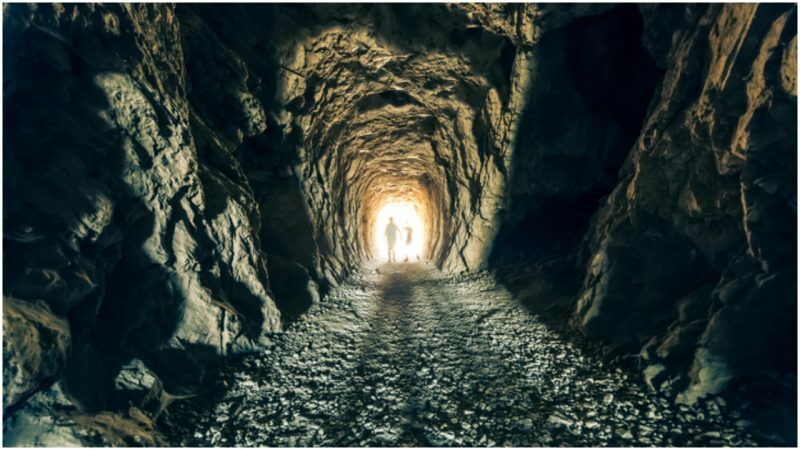 There is no official disclosure of the total size of the complex, nor exactly where all of the tunnels are located, but it is believed that they cover an area of more than 20,000 acres and connect all of the city’s major governmental buildings. There may have once been as many as 900 entrances. In Chinese, the underground city is known as Dìxià Chéng, meaning dungeon. It was created as a city-sized refuge from nuclear attack by ordinary people digging by hand, many of them equipped only with shovels and carrying everything in bamboo baskets. Work began in 1969 and the secret city continued to be expanded through to 1979. Tension between China and Russia during the Cold War came to a head in 1969 with the Sino-Soviet border conflict, an undeclared military skirmish that tested the will of both countries. The relationship between the two countries continued in a delicate balance right up until 1991. China was on high alert to the real possibility of full-scale war. 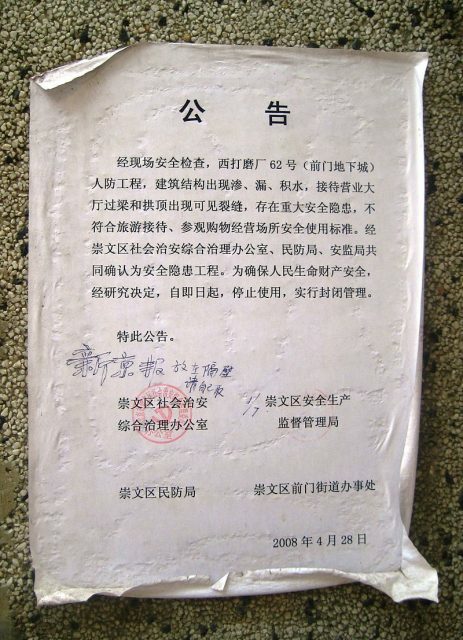 The response of Chairman Mao Zedong, President of the People’s Republic of China, was to instruct his citizens “Shenwadong, chengjiliang, buchengba” which pretty much translates as “dig deep tunnels, store food and prepare for war.” In Beijing, around 300,000 civilians quite literally dug in and carried out Chairman Mao’s ominous wishes. The Beijingers, under the guidance of army engineers, created a huge, complex underground network. 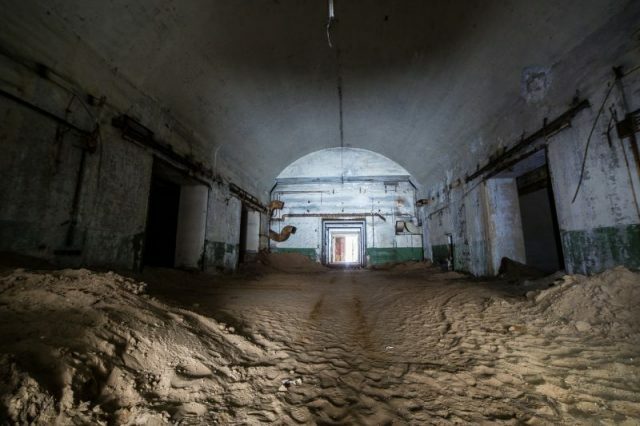 The various tunnel systems linked up around 10,000 atomic bunkers, plus restaurants, theaters, warehouses, factories, a mushroom farm, sports facilities, everything a community might need to survive a nuclear war. Even the ventilation system could be isolated from the outside air. According to some accounts, the Chinese government boasted at the time that the underground complex was large enough to accommodate the entire population of central Beijing, around 6 million people in 1969. Of course, Dìxià Chéng was never needed for its intended purpose. In the 1980s, several sections were handed over to neighborhood authorities, who turned these bunkers into offices and shops. 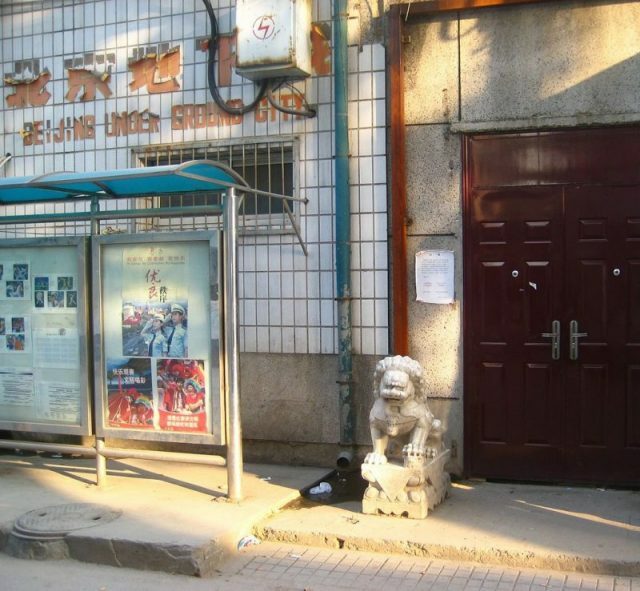 However, most of Beijing’s underground world is privately owned and there are still quite a few entrances from the basements of ordinary shops and apartment blocks. Taking advantage of the increasing number of people migrating from rural areas to find work in an already crowded Beijing, the owners of sections of tunnel system turned their bunkers into tiny residential units, offering them at around a third of the city’s skyrocketing rental prices. Known as the Rat Tribe, some of the residents have lived here for decades, while for others, life underground is a temporary stop-gap until they can afford to move into an apartment above ground. Conditions are cramped and damp. In 2010, because of worries about safety hazards that were not fixed by notoriously neglectful landlords, Beijing authorities ruled that nuclear shelters and subterranean storage areas could no longer be used for residential purposes. However, the residents have nowhere else to go, and they were allowed to remain, but with an uncertain future. In 2016, possibly due to increasing media exposure of the life underneath Beijing, the first group of tunnel dwellers were evicted–with no advance warning. Other residents are no doubt wondering when evacuation plans will be rolled out to include their district. But one man has turned what is a life-changing upheaval for the Rat Tribe into an opportunity to improve his community. Zhou Zishu, in collaboration with designers, artists, local citizens, and private companies, has brought to life an initiative to turn the recently vacated tunnels into a vibrant community center, complete with library, reading rooms, social area, cafés, kid’s play space, hair salon, and much more. There are also a number of shops and a gym. The vibrantly renovated nuclear shelter is named Digua Shequ, which is Chinese for Sweet Potato Community, a cute philosophical reference to the way this rhizome grows strong underground, seemingly with no beginning or end. But Zishu also picked the name because it reminds him of the first thing he ate when he arrived in Beijing: steaming hot sweet potato that his friend had brought along to greet him with at the airport. It is symbolic of the big difference that small gestures can make. Through running workshops and providing a platform for local business people to collaborate, the Digua Shequ has successfully brought together residents from both above and below ground, helping to remove the distrust between these groups. Official approval has been given for 10 similar projects to begin, a move which seems to indicate that subterranean Beijing will remain inhabited for many years to come. For now, the Rat Tribe continues to be allowed to thrive underground.